One of my favorite experiences of 2017 was seeing Hamilton on Broadway. I knew next to nothing about it going in, other than it roughly being about our founding fathers told in some sort of rap/hip hop format. And that the tickets were hard to get. In the car on the way down we ready the synopsis on Wikipedia. That was helpful and I'd recommend reading it before you go. But as Michelle Obama has said it was the best piece of art I've seen. Me: What part of @HamiltonMusical is best? The music, lyrics or story? 10 yo: The story. Everything supports the story. Once you've seen it you'll likely be thirsting for more. Here is some content I'd recommend checking out. This was basically all I listened to for six months after the show. I probably could have saved money by cancelling my Spotify subscription and just buying the soundtrack. The alliteration, consonance and density of lyrics is off the charts with instantly infectious melodies I haven't tired of yet. If you don't have a streaming subscription you can probably find it on YouTube. Or sign up for a free trial of Spotify (link to the soundtrack). Amazon Music (link to the soundtrack) is a pretty cool alternative because the lyrics scroll by while you're listening. There's also the Hamilton Mixtape which I'm personally not a fan of but might be worth checking out if you've really got it bad. This is good stuff. You can try to find it on YouTube. Or catch a rerun on DVR. Or maybe catch it OnDemand. The best way I found was to watch it on the PBS streaming service. You can get access to PBS streaming for a $5 donation to your local PBS station. Then you have to call and cancel it. Kind of a pain but worth it. Also terrific with Lin-Manuel Miranda getting sauced and telling Alexander Hamilton's story. Again, you can try finding it on YouTube but the best way I found for this one was via a Hulu trial subscription. 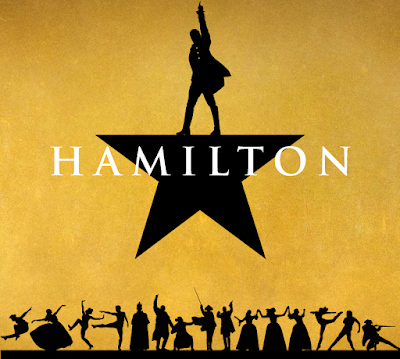 The genius of Hamilton is most evident in how Lin-Manuel Miranda took a long, dry, boring book and crafted such a concise and compelling story. I've been working my way through the audio book on Audible for months now. It has been a chore. I don't think I'll finish, but maybe you will. One of Hamilton's greatest achievements is how it inspires further exploration of a subject that's otherwise likely not on our radar screens. If you're in a position to see the show in person I can't recommend enough how worth your time and money it will be. I'd love to see Disney turn this into an attraction. I say that not out of irreverence but as high praise for what could be the most compelling way to inspire new generations to seek out more information about the stories surrounding our nation's founding. Say a live show at The American Adventure at Epcot's World Showcase? Throw in a related boat ride (a "row across the Hudson at dawn"?) and it would be amazing. It's not that crazy of an idea if you consider Lin-Manuel Miranda's involvement with Disney (Moana and the upcoming Poppins reboot). So, What'd I miss? What other content would you recommend for someone who hasn't seen Hamilton yet and is forced to Wait for it? For those who need Hamilton Non-stop?